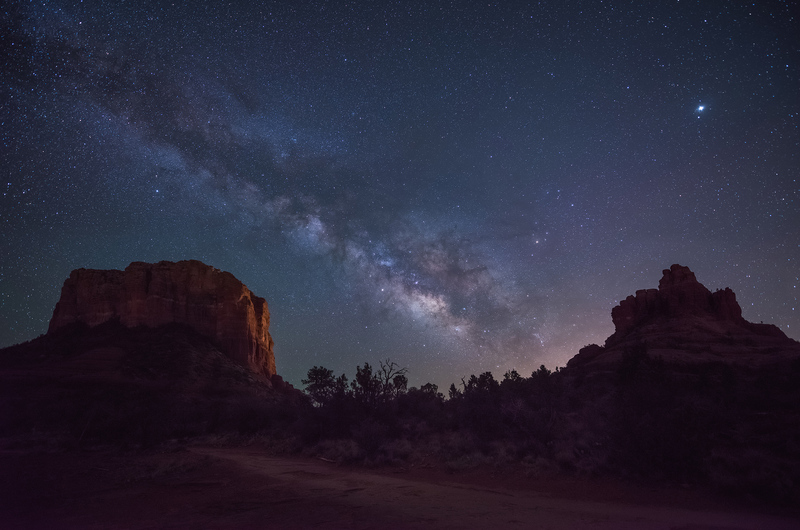 I shot this image at Sedona just before the summer solstice. I admire the lofty heights of the mountains, and the infinite expanse of the skies. But my heart skips a beat when the stars and spiral band of the milky way enlivens the landscape. As the night fell into darkness, I was awestruck by the sheer magnificence of the night sky illuminated by stars. Star clusters of Sagittarius glowing in reddish and bluish hues at the center of the milky way and Saturn shining against the dark dust lane. The bright red star Antares lined up next to Jupiter. And then the magic happened right in between Courthouse butte and Bell rock.